Erosion Control Fabric is offered in a variety of styles and materials to help successfully filter runoff, control erosion, and stabilize slopes in your area. Made in both synthetic and biodegradable options, these fabrics are able to control sediment in your location and prevent further erosion. Fabrics featured here have been used in a wide range of applications including slope stabilization, sediment containment, runoff filtration, home protection, and vegetative regrowth. 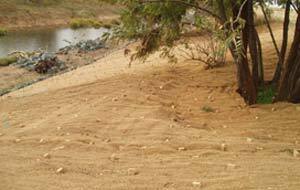 Please feel free to contact us at 1-772-646-0597 to discuss your erosion control requirements. Regardless of your location, each erosion control fabric is equipped to provide support, stabilization, and reinforcement for your area. Depending on your conditions, sites may also require a filtration component to help maintain a clear water flow from your site. 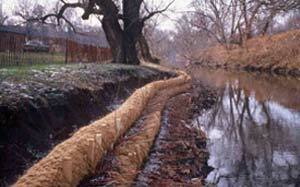 Filtration products can include wattles, geo filter fabrics, and logs in increase flows from your site. These geotextiles are a frequent choice for applications involving stabilization along a slope or specific area. When compared to something like the coir erosion control mats, these geotextiles can offer more of a long-term stabilization and separation solution to erosion control issues. Biodegradable erosion control products are often used in locations where natural habitats, vegetation, or wildlife is present. Rather than using plastics or polypropylenes, these products feature all-natural components that will biodegrade on their own over extended periods of time. This not only protects surrounding areas, but also decreases maintenance requirements as the product will biodegrade on its own. 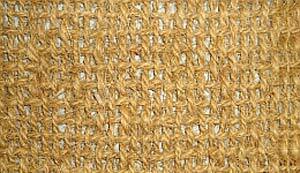 Coir Erosion Control Mats: Varying in weight for slopes up to 1:1 and water flows up to 17 fps. Any time you are using biodegradable or synthetic erosion control fabric, having a product to secure the mats to the ground is often essential to proper installation of your material. 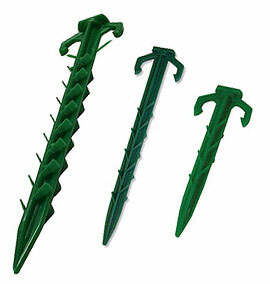 In addition to wood stakes and sod staples, we also offer Biodegradable Plastic Stakes and Staples. These items are made from a biodegradable material that will break down over time. All remaining particles are safe for the environment and do not require removal. Can I used Coconut Coir Logs for Erosion Control?